Short Review: This is a lightweight gi, with a 420gsm pearl weave jacket and ripstop trousers. 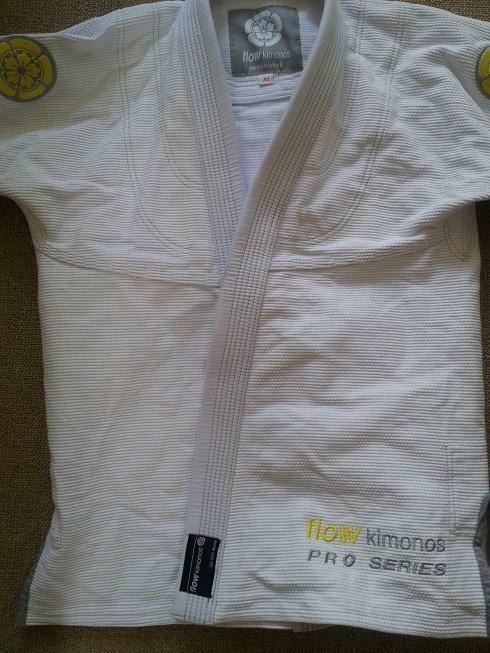 Though there are a few patches and some embroidered text (attractively combining yellow, white and grey), in general the Pro Series 2.0 is a relatively minimalist gi. Flow Kimonos have attempted to cater to a broader range of sizes, with L (tall) and H (heavy) options in addition to the standard A measurements (but only for certain sizes). The jacket is a little abrasive, but that may reduce with repeated washes. Available to buy here for $135 in white or black ($10 extra). Full Review: Flow Kimonos are based in Boston, started by Jonathan Leung in January 2012. They have a stated mission to "do our best to leave this planet close to how we found it", reflected by how their interest in using organic cotton is highlighted on the site. They are also one of the very few companies investing in hemp gis. Although the Flow Kimonos hemp gi is not yet available, I'll be interested to see how it performs upon release, particularly as the currently advertised price is a little lower than their competitors. Flow Kimonos hemp belts are for sale, but use a hemp/cotton blend (by contrast to the gi: the statistics proudly proclaim the jacket and trousers will both be 100% hemp). There are numerous other aims and mission statements on the 'about us' page, a level of detail which perhaps reflects the need for gi brands to mark themselves out from the increasingly saturated gi market (a recent topic of discussion in the BJJ online community, such as on reddit and LinkedIn). For at least the past decade, perhaps longer, gi companies have increasingly focused on fashion rather than function: the best example is Shoyoroll, who charge huge prices but appear to rely on limited batches with minor variations in colour and embroidery. There's nothing wrong with that if people are willing to buy their product, but it suggests an opportunity for gi companies willing to put more effort into other areas. Flow Kimonos are positioning themselves as an ethical brand, with some similar sentiments on their website to brands like Datsusara and the Green Gi (who not coincidentally both sell hemp gis as well). Sustainability is emphasised, as interestingly is community service. This is something Fenom do very well, with open mats, seminars and competitions aimed at encouraging and supporting women. Tatami have also made significant contributions to charity events: for example, the GrappleThons were greatly enhanced by their support. We've donated a batch of hemp belts to support TCO's initial fund raising effort. Andy, FK'S cofounder, who is based out of LA now, is looking to hook up with a BJJ tournament circuit as a sponsor. He is also planning on supporting a women's traveling open mat group in south California. As we start to make more money, we will be able to reinvest the profits into more and more community projects. We are also sponsoring lower belts to help them reach their goals. I feel like a lot of the higher belts are further along in their goals, so it's more important to help out the guys just starting out. 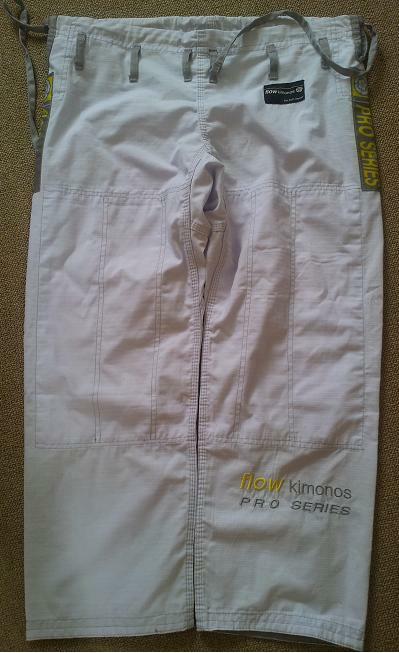 The Pro Series 2.0 is described by Flow Kimonos as their "flagship competition gi". The jacket is a fairly light 420gsm pearl weave, comparable to the Kingz Ripstop v1, but not at the levels of Gorilla (250gsm) or the Tatami Sub Zero (350gsm). The material felt somewhat abrasive (particularly compared to the soft Sub Zero) initially, which I could feel on my shoulder during some extended running escape drilling a few weeks ago, but that may lessen over time. It's pre-shrunk, with Flow Kimonos promisingless than 2% shrinkage. From the two washes I've done at 30 degrees Celsius then air dried, that has so far proved to be true: there wasn't any noticeable shrinkage when air drying inside. I only noticed a difference when I intentionally hung the jacket in the sun (it's been hot for the UK: that day was around 30 degrees celsius), when the wingspan went from 152cm to 150cm, while the shoulder to the bottom of the jacket shifted from 76cm down to 73cm. The trousers stayed at 90cm: I didn't risk putting those outside, as that's my ideal length for trousers. Flow Kimonos also say that the fabric is both antimicrobial and anti-odour. As with similar claims from Datsusara and Gimono for their products, that is difficult for me to verify without a laboratory and a science degree. It didn't smell much after training, but to my layman nose I couldn't say it was any more or less pungent than other gis I've worn after a sweaty rolling session. Minimal design is another stated aim. Generally speaking that's borne out by the Pro Series 2.0, though my personal standards of 'minimal' are extreme. For my taste, I'd prefer there wasn't any text on the gi, leaving just the attractive yellow and grey Flow Kimonos logo (like Datsusara, Flow Kimonos apparently take inspiration from Japanese heraldry) on the sleeve and the trouser leg. A hefty chunk of text clutters the lower part of the jacket and the trousers, which is time-consuming to remove as it is embroidered rather than a patch. Still, that remains minimal by the standards of many other gis. It should also be noted that the quality of the embroidery looks high. There is grey contrast stitching throughout the gi, along with grey tape lining the cuffs and inside lower jacket, along with grey piping on the side vents. 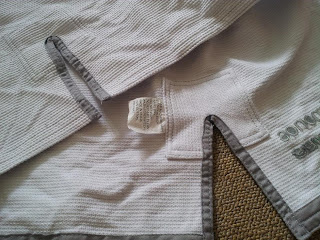 The label near that vent reveals that this gi is made in China (it tends to be either China or Pakistan, though some US based companies are looking into local production). Armpits are reinforced with the usual rounded lozenge of fabric, with more material for the vents. Here Flow Kimonos have gone for a square of material rather than the triangular shape seen in some other gis. The collar is average sized, covered in ripstop. The trousers are 8.5oz ripstop cotton, with the same grey contrast stitching. There are six belt loops, also grey, with a grey drawstring. 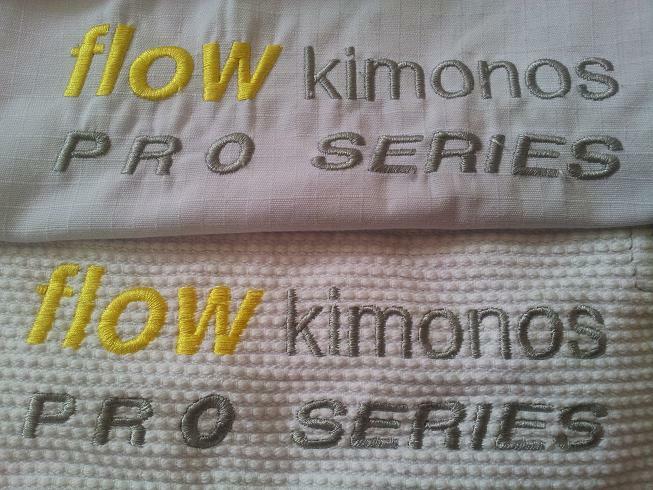 Flow Kimonos buck the trend of rope drawstrings, which they had used for the Pro Series 1.0, deciding instead on a classic flat cotton drawstring for the Pro Series 2.0. If you want to replace that string, note that the diameter of the drawstring housing on the front of the trousers is marginally smaller than on other gis I own. Testing this, it was a tight squeeze to put in the thick rope drawstring from the Gorilla Hitman, though it does eventually fit if you're careful (which reminds me: make certain that if you're using the squashed coathanger method you don't leave any sharp edges, or with a smaller drawstring housing, it will catch). The aforementioned large slab of embroidered text from the lower jacket of the gi is repeated at the bottom of the left trouser leg. 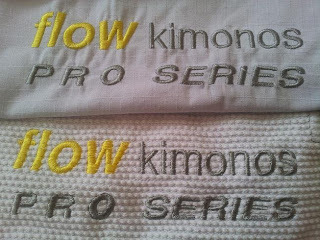 There are also two patches on either side of the leg, featuring the logo and the text "Flow Kimonos" and "Pro Series" respectively. The trousers were comfortable and light, though as with many gi trousers, the extra layer of fabric meant to reinforce the knees only just covers the kneecap when you kneel on the floor. If you have trouble finding a well fitting gi, then you'll be pleased to hear that Flow Kimonos offer a broader range of sizes than most companies, providing for both the taller and the heavier grappler (L and H sizes respectively). That means this gi purports to cater to somebody ranging from 5'3" and 130lbs all the way up to 6'3 and 245lbs. On my meagre 5'7 and 145lbs frame, the A1 was a decent fit. 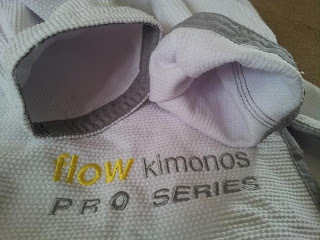 For those who want something a bit heavier and slightly less minimal than the Sub Zero, the Flow Kimonos Pro Series 2.0 could be a good option. The company's ethical stance is also appealing, as long as they can back up their claimed willingness to "contribute to as many projects as possible." The Pro Series 2.0 is available to buy here for $135, in white or black ($10 extra). That's a little more than I would normally spend on a gi, but is comparable to the Tatami Sub Zero ($120) I reviewed last week.